Through RJIF’s inaugural project, “The Independent Investigation Commission on the Fukushima Nuclear Accident”, the vulnerability of Japan’s crisis management system rose to the fore. In response, we thus initiated the “Crisis Management Project” to identify various issues within Japan’s crisis management systems and consider how such systems could be improved. To this end, we engaged 20 specialists (including university professors, think tank researchers, journalists, and lawyers) and examined by focusing on the nine worst-case scenarios ranging from natural disasters to military clashes. These nine crises represent neither a prediction nor a forecast; each scenario is the products of an imaginative thought process for what would be able to happen if the crises did developed in the most catastrophic manner. However, this analysis still clearly reveals various issues within Japan’s current systems and its capacity to withstand a crisis. 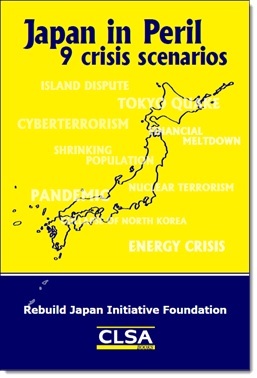 The original version (Japanese) was published in March 2013, and the English-translated version (titled “Japan in Peril -9 crisis scenarios”) was published in February 2014. 8. Nuclear terrorism: Did we learn anything from 3/11? In response to China’s increasing menace over the Senkaku islands, Japan must prepare for a battle entailing a collective effort; it will require not only military force, but also efforts in the spheres of diplomacy, politics, economics, and information transmission. Once the smoke has cleared, the outcome will dramatically alter the prevailing order and power dynamics of East Asia. Japanese government debt has soared to more than 200% of GDP. At just 10%, consumption tax is a mere drop in the bucket. Nevertheless, owing to the competitiveness of the manufacturing industry and the sheer enormity of the economy, a southern European-type collapse can be avoided. But what waits in the aftermath…? The probability of an earthquake directly hitting Tokyo within the next 30 years surpasses 70% in some areas of the city. Preventive measures are being taken based on the lessons of the Great Hanshin-Awaji Earthquake and the Great East Japan Earthquake. However, the idea is merely a “convenient scenario”. Preparations thus do not assume the worst, and the demonstrable effectiveness of the measures is therefore questionable. Apparently, some countries – including Israel, North Korea, and China – are amassing hackers to form a covert cyber-attack force. A new war targeting the modern lifeline, threatening to paralyze critical infrastructures, has thus begun. In the midst of a raging unknown virus outbreak, the medical field will face the crisis of an impending collapse through lack of adequate medical staff and equipment. Solving the problem will hinge on whether difficult decisions can be made about who should die first. Forty years have passed since the oil crisis stemming from the 1973 Yom Kippur War. Although there has not been much cry for a review of Japan’s energy strategy, there is a growing dependence on the Middle East. The ongoing state of affairs is such that a disturbance in the Straits could lead to a nationwide standstill for Japan. In the wake of the unification of North and South, the rising nationalism radiating out from the Korean Peninsula will spread through East Asia in a domino effect. The forbidden scenario of a nuclear-armed Japan will become a real possibility, and regional dynamics will immediately destabilize. Gradually but surely, the shrinking population will undermine Japan. Unless prompt action is taken, despair will sweep Japanese society in just a few short decades. However, to avert such a scenario, we must be prepared to relinquish the traditional Japanese views on society, family, and marriage.